The Harlem Repertory Theatre, under the direction of founding artistic director Keith Lee Grant, presents a rare revival of Harold Arlen, Yip Harburg, and Fred Saidy’s colorful musical Jamaica, for 17 Saturday evening performances from July 29th – March 24th at the Tato Laviera Theatre (240 East 123rd Street). 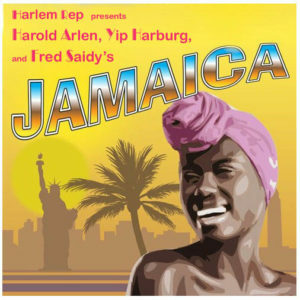 The Harlem Repertory Theatre, under the direction of founding artistic director Keith Lee Grant, presents a rare revival of Harold Arlen, Yip Harburg, and Fred Saidy’s colorful musical Jamaica, for Saturday evening performances from July 29th – March 24th at the Tato Laviera Theatre (240 East 123rd Street). The production continues HRT’s revival of shows with Harburg lyrics. This began in 2009 with Flahooley, continued with The Wizard of Oz last year, and with Finian’s Rainbow (music by Burton Lane), and Bloomer Girl (music by Arlen) in 2018 and 2019. Jamaica, with book by Harburg and Saidy, is set on Pigeon Island off the Jamaican coast. It tells about a small community fighting to avoid being overrun by American commercialism. A young romantic, Savannah, however, dreams of escaping to New York for a better life and where she hopes to find true love. A business man from New York proposes marriage and Savannah is ready to depart for greener pastures. When a poor fisherman, Koli, saves her brother’s life during a powerful hurricane, she opts to remain on the island, and with him. 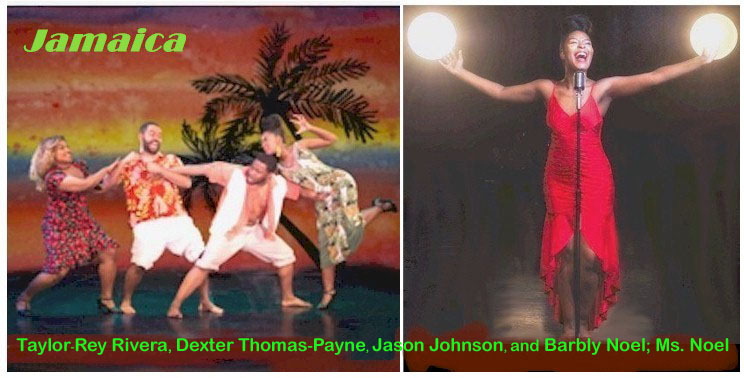 The cast of Jamaica features Taylor-Rey Rivera (Savannah), Barbyly Noël, Corean Robinson, Dexter Thomas-Payne (Koli), Daniel Fergus Tamulonis, Derrick Montalvado, and Jason Johnson. Harburg and Saidy’s socially conscious satire Jamaica, which introduced an interracial cast in lead roles to 1957 Broadway, was co-written by Harburg when he was a victim of Senator Joseph McCarthy’s Hollywood Blacklists and communist witch hunts. Since he couldn’t find work in Hollywood, he focused his talents on Broadway. The show’s powerful political themes (racism, classism, and capitalism) resonate today as they did in 1959 when this groundbreaking musical opened on Broadway. Production dramaturge Deena Harburg, daughter-in-law of the late lyricist [married to son Ernie], worked closely with her father-in-law. She’s the founding chair of the NYU Tisch Graduate Musical Theater Writing Program, and author of Fascinating Rhythm: The Collaboration of George and Ira Gershwin. “fresh, new perspective” by Art Perlman, who adapted the Broadway script for the Tony-nominated 2009 revival of Finian’s Rainbow. Grant [CCNY Department of Theater and Speech professor], an AUDELCO [Audience Development Committee] Award-winner, is a triple threat – directing, choreographing, and designing sets. Musical director is Dror Baitel, with arrangements by Dan Aran. Costumes and puppets are by Daniel Fergus Tamulonis; projections by Brian Blanco; animation by Edward Corcino. Saturday nights at 7 P.M., once a month to start and then two and three Saturdays monthly. For specific dates, visit www.harlemrepertorytheatre.com. Tickets are $25, general admission; $50, premium seating; and $15 for students/seniors (plus $2 per ticket service charge). To purchase, call Smarttix at (212) 868-4444 or buy online at www.smarttix.com. Call (917) 697-3555 for reservations or group rates. There is secure underground parking for $10 at East 122nd Street, between Second and Third Avenues. Visit the site for performance information and tickets for HRT’s revival of Lorraine Hansberry’s A Raisin in the Sun; and Lynn-Manuel Miranda’s In the Heights. largely due to the popularity of Harry Belafonte. Jamaica was tailored to capitalize on his charisma and success as a recording artist; and the beauty and singing chops of Lena Horne, a top-selling recording artist and rising film star at M-G-M. The musical, produced by David Merrick, had troubled pre-Broadway try-outs. During the Philadelphia run, Merrick grew to despise the script and demanded changes. Harburg and Saidy, with the mega success of Finian’s Rainbow under their belt, refused. Merrick threatened to close the show. Joseph Stein [later, the Tony-winning book writer of Fiddler on the Roof] was brought in to rewrite. In the process, Horne and husband Lenny Hayton, also Horne’s music director and manager, raised the specter of her recording success and burgeoning movie career. Suddenly the show became a showcase for her, and with an ever-growing list of demands. Just as suddenly, Belafonte feigned illness and withdrew. Film star Ricardo Montalban became the male lead. Then, there was the matter of musical director musical chairs. Waving the baton before a 25-piece orchestra [with four musicians handpicked by Ms. Horne, who were told to follow her tempo and hers alone], was esteemed conductor and arranger Lehman Engel, who stepped aside when, as has been reported by Steve Cohen (The Cultural Critic), Arlen wanted his brother Jerry to conduct. However, Ms. Horne refused to work with him. His replacement, veteran conductor Jay Blackton, barely made it to the Boston tryout before clashing with Ms. Horne. He was fired. With the dust settled, Jamaica opened on Broadway October 31,1957. In addition to Montalban as Koli, the show co-starred Adelaide Hall (cast in the original Shuffle Along), Josephine Premice, Ossie Davis, and 26-year-old Alvin Ailey (lead dancer). The choreographer was Hollywood/Broadway’s brilliant Jack Cole. On the basis of Ms. Horne’s pedigree, the show played 555 performances, and garnered seven Tony nominations, including Best Musical, Best Actor, Best Actress, and Featured Actor (Davis) and Actress (Premice). The Yip Harburg Foundation (www.yipharburg.com) was created after the lyricist’s death to carry on his legacy and to promote educational opportunity, social/economic justice and world peace. President Ernie Harburg co-authored Who Put the Rainbow in The Wizard of OZ? Yip Harburg, Lyrics.